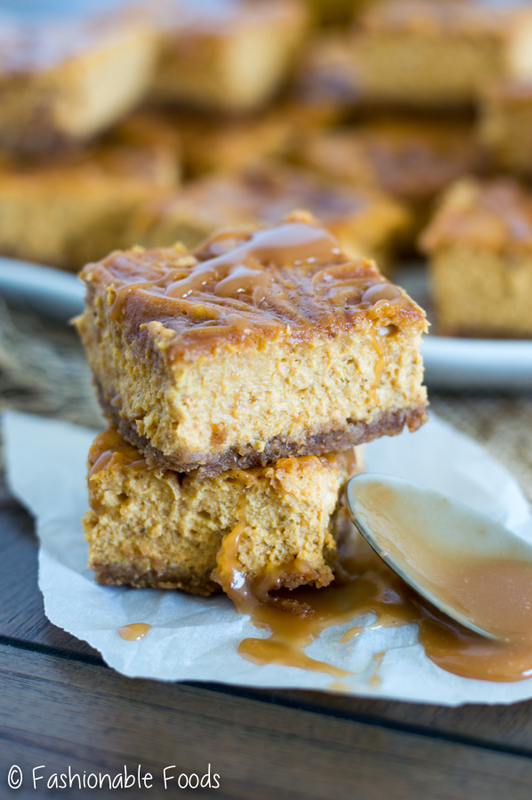 Caramel swirl pumpkin cheesecake bars make for the perfect fall dessert. 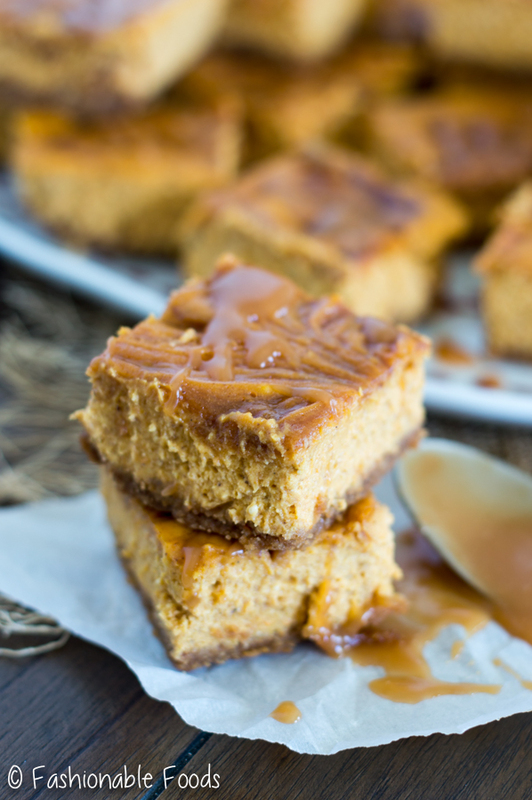 Full of pumpkin, warm spices, and sweet, sticky caramel sauce these tasty bars are irresistible! 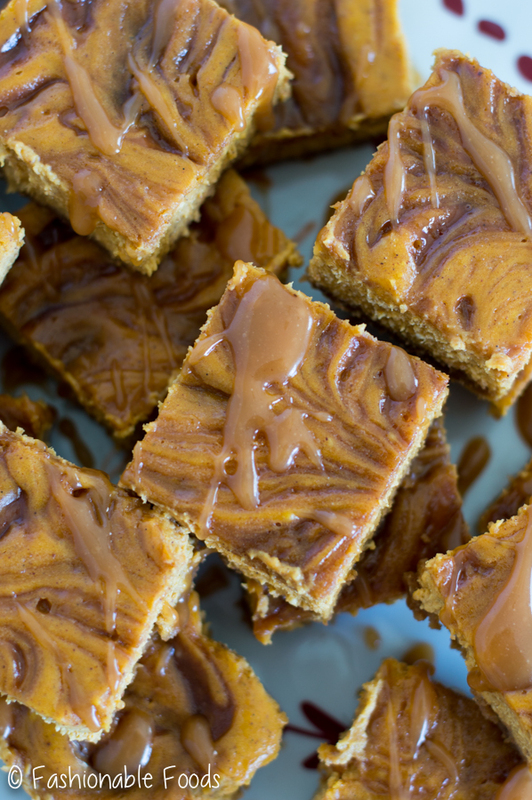 Caramel swirl pumpkin cheesecake bars. I’m pretty sure anything that begins with caramel swirl is going to be pretty amazing, am I right? And we all know that I have a slight obsession with caramel sauce. Do I even make desserts without it anymore? Is it too much? No. Too much caramel is not possible. And paired with pumpkin cheesecake? YES, please. So, how’s your Tuesday? Oops, I mean Halloween. I kind of forgot it was Halloween. ? I say it every year, but I don’t really like Halloween. What can I say? I always disliked dressing up and I’ve never been a candy fan. So, there’s not much for me to get excited about when it comes to Halloween. I will however, be handing out candy tonight… which is always fun! 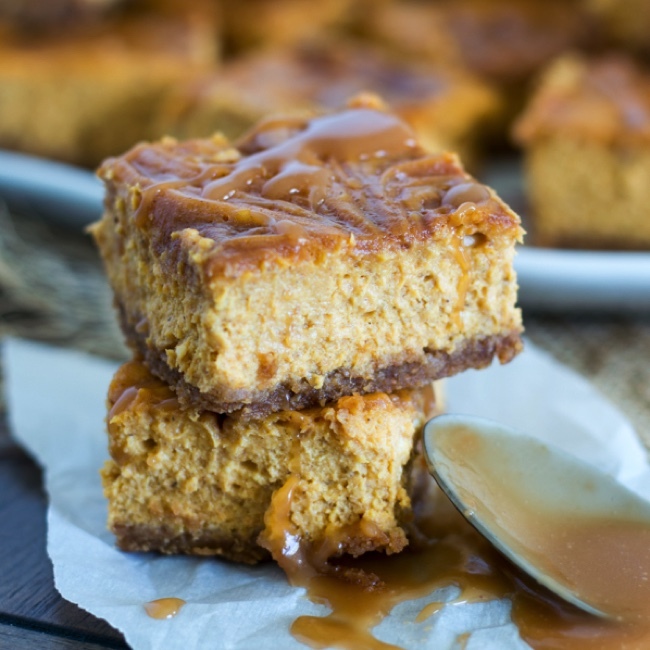 Ok let’s dive into the specifics of these caramel swirl pumpkin cheesecake bars. I originally wanted to make this as a full size cheesecake, but then decided on bar form. Mostly because this cheesecake would make a fantastic Thanksgiving dessert. However, with the turkey, all the sides, and usually a few dessert choices, a big ole cheesecake may end up being too much. Especially if you’re like me and need to sample everything. 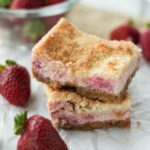 Cheesecake bars, though are much more manageable since they are small. Which makes it much easier to fill up your dessert plate with all the goodies and not feel too guilty. Cheesecake doesn’t have to be intimidating, you just need to remember that a water bath for baking is a must. This will ensure even baking and no cracks. You’ll also need adequate chilling time. 4 hours minimum, but preferably overnight… which makes these bars the perfect make-ahead dessert for Thanksgiving! ? I only chilled mine for about 2 hours because I was racing the daylight to get these photos. That’s why they don’t have that clean-cut look. Still tasty, but difficult to cut… so make sure you adequately chill! 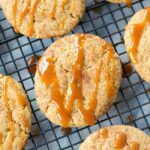 As always, I recommend making your own caramel sauce, but you can certainly use your favorite jarred variety. Making it is easy.. and once you do it, you’ll never buy it in the store again! And you’ll want to put it on everything. Duh! Have a great week and enjoy your Halloween! Line an 8x8-baking dish with aluminum foil, draping it over the edges to make it easy to lift out later on. In a bowl, combine the graham cracker crumbs and butter and mix well. Press the mixture into the prepared baking dish. Bake the crust for 8-10 minutes or until set and lightly golden brown. Cool the crust completely. While the crust is baking and cooling, make the caramel sauce. Combine the sugar and water in a medium saucepot and bring to a boil over medium heat. Boil the sugar until it’s amber in color, and then carefully stir in the butter. 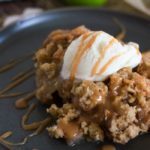 Remove the caramel from the heat and carefully stir in the heavy cream – it will spatter, but just keep stirring until you have a smooth caramel sauce. Set aside while you prepare the cheesecake filling. 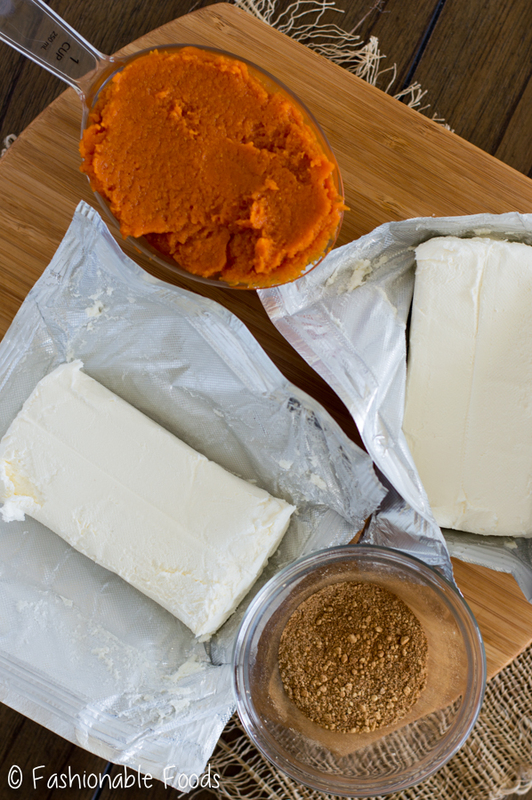 In the bowl of a stand mixer, combine the cream cheese and pumpkin puree and whip until smooth. Add in the sugar, vanilla bean, salt, cinnamon, ginger, nutmeg, cloves, cardamom, and pinch of black pepper. Mix well, scraping down the sides as necessary. With the mixer running on low, add in one egg and when it’s completely mixed in, add in the next. Pour the filling over the prepared crust and then dollop the caramel sauce by the spoonful over top of the filling (you won’t use all of the caramel sauce). Using a wooden skewer or knife, drag it gently through the caramel and filling to create a nice swirl pattern. Be gentle here and don’t overdo it or you’ll lose the swirl pattern. Place the baking dish into a roasting pan and pour enough hot water into the pan so that it comes up halfway on the baking dish. Bake the cheesecake bars for 45-50 minutes, or until mostly set, but the center will still jiggle. Turn the heat off and crack the oven. Allow the cheesecake to cool like this for one hour, then remove the pan from the oven and allow the bars to cool completely. Refrigerate the cheesecake until cold, at least 4 hours, but preferably overnight. Lift the cheesecake out using the foil and lay on a cutting board. Using a knife (run it under hot water to make cutting cleaner) cut the cheesecake into bars. 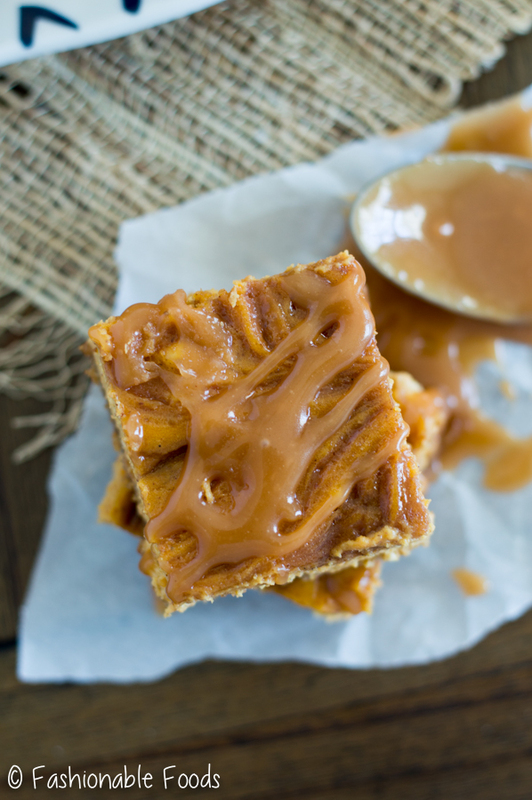 Drizzle some additional caramel sauce overtop of the bars before serving. Enjoy! 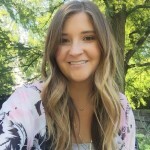 *Use regular graham crackers if you aren't gluten-free! Hope you had fun handing out candy at least! Since we moved to a new neighborhood in town I thought we would get trick or treaters this year, but nope! Not one! Not that I really mind, Because it just means our dog didn’t howl constantly. 😉 Anyways, anything that begins with caramel makes my heart skip a beat, and these bars are calling my name!! They look beyond delicious, girlie!! Pinned! Cheers! I did 🙂 Too bad you didn’t get any! But that just means more candy for you.. and a happy night for your dog! Thanks for the kind words and pin, Cheyanne!